According to early results from the NBC News Exit Poll, two-thirds of Florida voters consider climate change or global warming to be a severe problem. Only three in 10 voters in the state think climate change is not posing serious challenges. 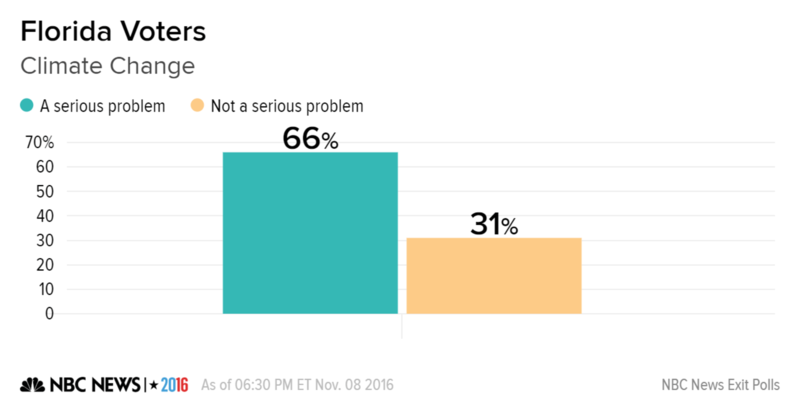 Clinton voters overwhelmingly believe global warming is a pressing problem. Trump voters are less likely to be concerned, but even among them about four in ten say it is a serious problem. Iowa — which President Obama won by a comfortable 6 percentage points in his path to re-election in 2012 — has proven to be one of the strongest swing states for Republican Donald Trump this year. Results from the NBC News Exit Poll in Iowa explain one reason why: only one in three of the state’s white men are supporting Democrat Hillary Clinton. Iowa remains one of the least racially diverse states in the country, and thus the battle for the state’s white voters is key to victory there. Exit polls showed a dramatic gap opening up over the past few elections among white men in Iowa. They split between Obama and GOP rival John McCain in 2008, swung solidly toward Republican Mitt Romney in 2012 and are soundly rejecting Clinton this year. NBC News characterized Iowa as too close to call when polls closed at 10 p.m. ET on Election Day. Donald Trump won his party’s nomination as the ultimate outsider to Washington and the GOP establishment. The friction between Trump and the GOP establishment turned personal in Arizona where U.S. Senator and former Republican party presidential nominee, John McCain, was up for re-election today. Trump cast aspersions on McCain as a former prisoner of war and celebrated military veteran during the campaign. McCain lashed back when Trump criticized the family of a slain soldier who was a Muslim immigrant. Both men refused to endorse the other in their respective election campaigns this year. What’s a loyal Republican to do? According to NBC Exit Polls, about three-quarters of McCain voters kept their presidential vote within the party but about one-in-seven McCain voters chose Democrat Hillary Clinton and one-in-ten picked a third party candidate. More than a third of McCain voters in Arizona have an unfavorable opinion of Trump and a similar share say he does not have the temperament to be an effective president. Trump may yet win the state, but his feud with John McCain made his path more difficult. If Donald Trump is elected president, he will encounter a divided nation where many Americans are deeply troubled about what his presidency will mean. According to the NBC News Exit Poll, two-thirds or more of Asian, black and Hispanic voters have profound reservations about Trump as the next U.S. President. 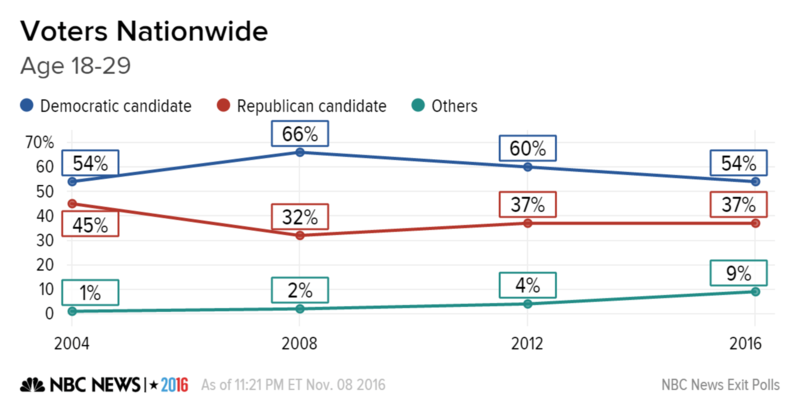 Indeed, more than two-thirds of blacks and 45 percent of Hispanics admit being “scared” about Trump winning the election. 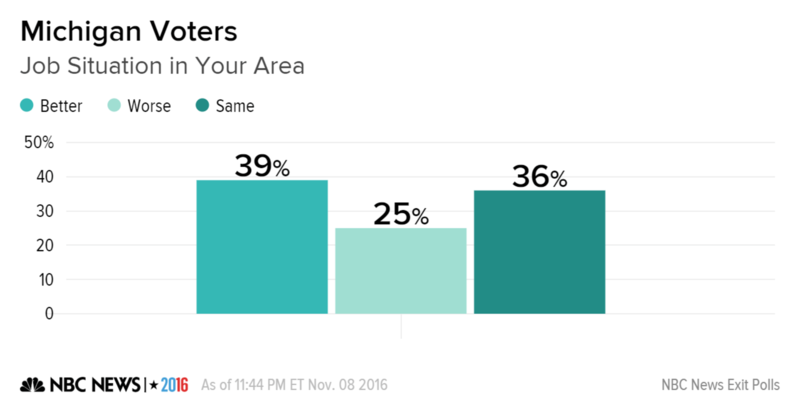 The feelings of white voters about Trump being elected are more split. 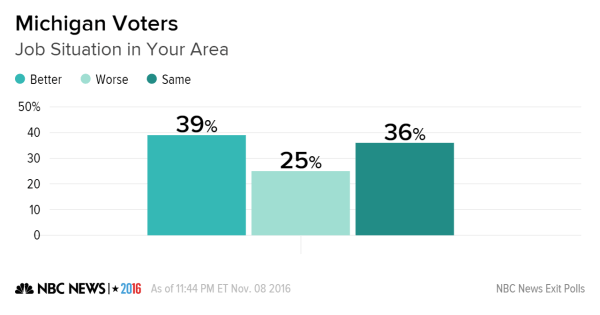 Though only 15 percent are “excited” about Trump being elected, an additional third are optimistic. The other half of white voters is expressing alarm, including three in 10 indicating saying they are “scared” about a Trump presidency. Wisconsin has been a solidly blue state for decades; the last time it went to a Republican for president was when Ronald Reagan won in 1984. But the Badger State’s demographics are quite favorable to the Trump campaign, since whites typically make up well over 80 percent of the electorate and manufacturing is a key component of the state’s economy. If Trump is to win Wisconsin, he needs to do very well with non-college whites. And according to the NBC News Exit Poll, he is winning that vote by a whopping 31 points, which is noticeably larger than Mitt Romney’s 8-point margin in 2012. If we look at the policy view of these Wisconsin working-class whites, we see a clear majority agree with Trump’s views on trade – 61 percent say it takes away U.S. jobs. But they do not share his hardline view on immigration. Working-class whites in Wisconsin are much more likely to feel that undocumented immigrants in the U.S. should be offered a chance to apply for legal status than say they should be deported to the country they came from. So while working-class whites don’t necessarily support all of Trump’s harder-line policies, they did vote vote for him overwhelmingly in Wisconsin, as they did across country. 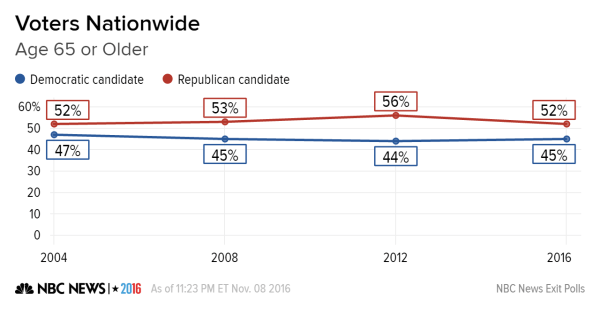 Nationally, Clinton is winning the women vote by more than a 10-point margin, but the woman vote is far from monolithic. A number of female voting groups are breaking for Donald Trump tonight and have helped propel him to victory in a number of battleground states. 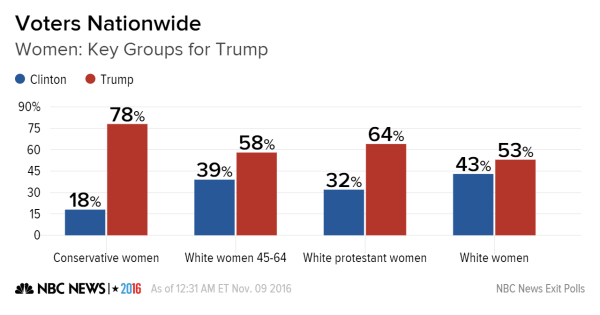 White women overall are going for Trump by about 10 points, and white women who are middle age are going from Trump by nearly 20 points. We also see white Protestant women favoring Trump by a sizable 32-point margin. 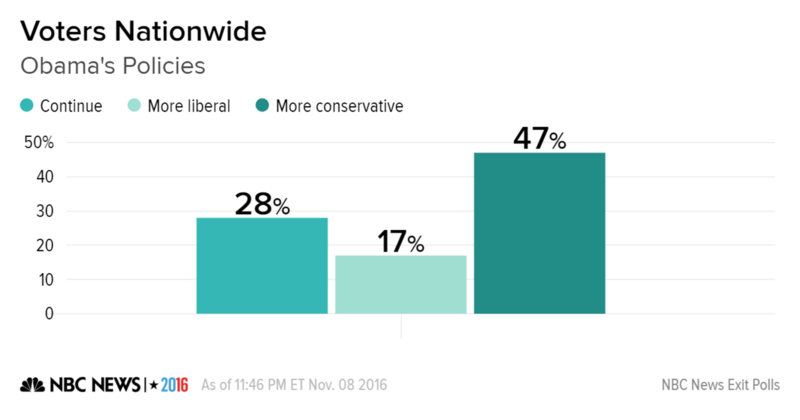 And women who describe themselves as conservative are going overwhelmingly for Trump, 78 percent to 18 percent. A majority of voters nationwide approve of how Obama is handling his job as president. But voters are closely divided over the policy direction for the country. Forty-five percent of voters nationwide said the next president should continue Obama’s policies or move policies in a more liberal direction. And a similar share said that policies should move in a more conservative direction, according to NBC News Exit polls. President Obama hit the campaign trail over the past few days to remind voters that this election is a referendum on his past eight years in office. A vote for Obama’s former secretary of state, Hillary Clinton, would send a clear thumbs up on Obama’s legacy. 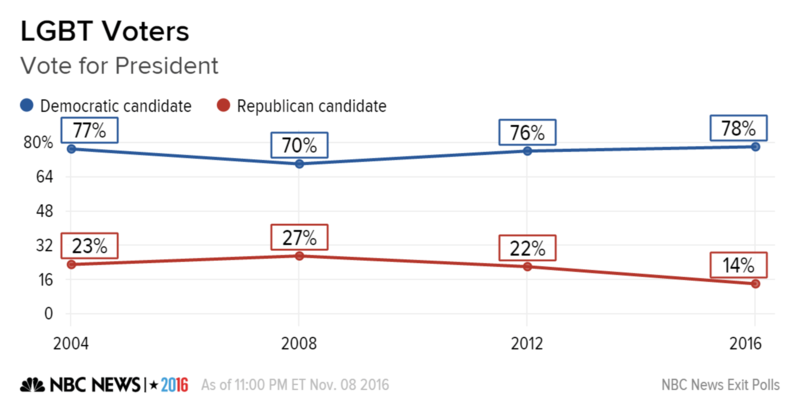 The election of Trump, a notably unconventional candidate for the GOP, would signal a thumbs down and shift of direction ahead. But, asking voters to stick with the status quo in sour times is a tough message. The nominating campaigns were marked by lingering economic anxiety over jobs. 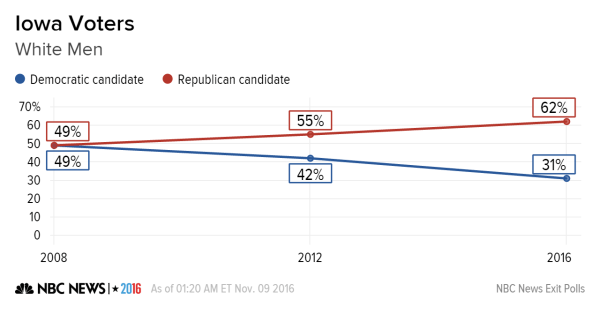 And the NBC News Exit Polls found voters even more negative about the direction of the country than they were four years ago. About six in 10 voters nationwide said the country is headed in the wrong direction, and about a third thought we are on the right track. Optimism about the direction of the country is down 13 points from four years ago. Voters today who think the country’s direction is wrong are voting for Trump by a more than two-to-one margin. And a majority of voters have a gloomy assessment of the federal government. About four in 10 voters are dissatisfied with the way the government is working, and another two in 10 are angry about the way the government is working. Only about a third of voters — 29 percent in NBC Exit Polls — have positive views about the way government is working. Earlier this evening, Donald Trump pulled off an important victory in Ohio, which had gone Democratic in the prior two presidential elections. This begs the question as to whether we will see a similar result in neighboring Michigan, which has some key demographic similarities. In Michigan – as in Ohio – Trump is trouncing Clinton among working class whites. Trump is winning that vote by more than 30 points in Michigan, which is substantially larger than Romney’s margin in 2012. But unlike in Ohio, voters in Michigan are not necessarily convinced that Trump is the stronger candidate when it comes to the economy. 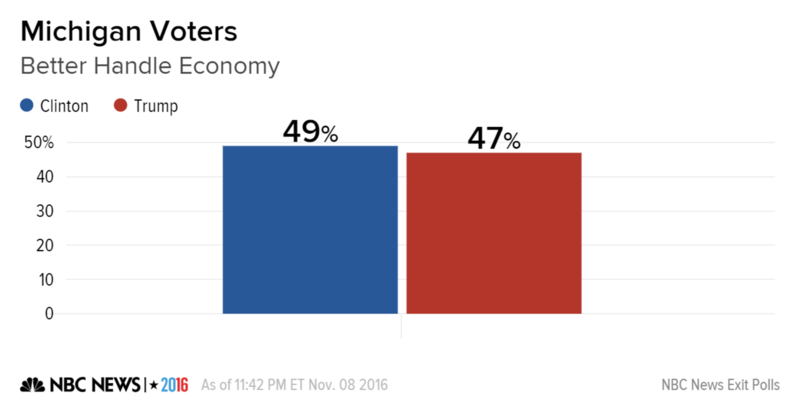 In Ohio, more voters felt Trump would better handle the economy than Hillary Clinton. But in Michigan, Clinton has a narrow 2 point lead on handling of the economy. Another bright spot for Clinton in Michigan are attitudes about jobs. About four in 10 Michigan voters feel that the job situation in their area is better now than it was four years ago, while a quarter say it is worse than four years ago, and 36 percent say it is about the same. But an encouraging result for the Trump campaign are attitudes about trade in the Great Lakes state. Half of Michigan voters share Trump’s view that trade takes away U.S. jobs, while less than a third say that it creates more jobs. So on the whole, Michigan is not quite as favorable to Trump on economic issue as Ohio was, but it is still a very close race. 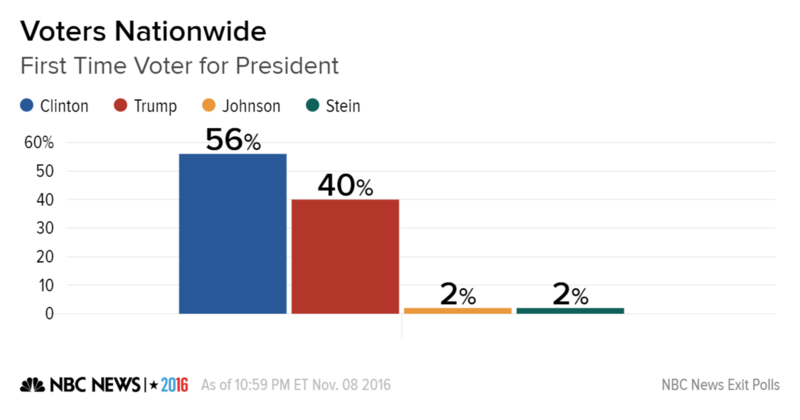 Third-party candidates have proven attractive to voters under age 30 this year, according to results from the NBC News Exit Poll. 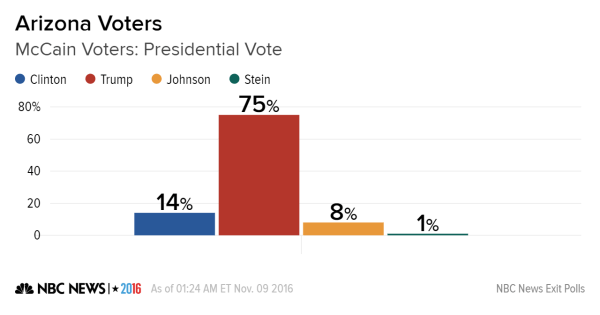 About half of those who voted for a third party went to Libertarian Party candidate Gary Johnson; the remainder went to Green Party candidate Jill Stein and scattered others. Third-party votes appear to have slightly narrowed the advantage the Democrats have enjoyed in previous elections among 18-to-29 year olds. 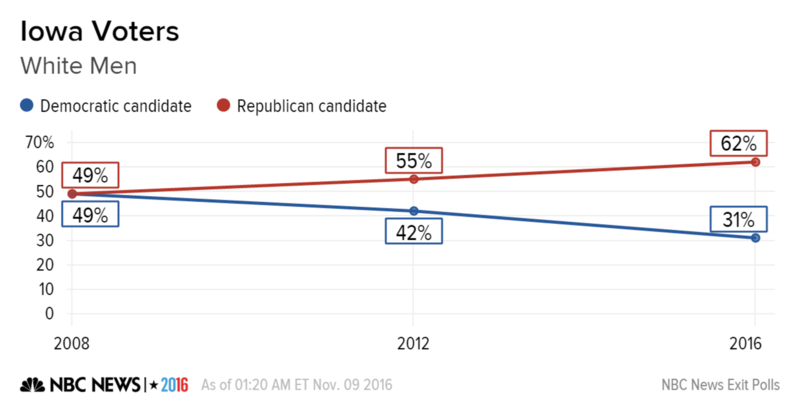 Democrat Hillary Clinton’s lead over Republican Donald Trump is substantial among these voters, but it is currently smaller than the impressive margins racked up by Barack Obama with young people in his 2008 and 2012 presidential campaigns. By contrast, it appears that the nation’s older voters—those aged 65 or over—are remaining loyal to the major parties this year. Support for other candidates among this group is limited to just a few percentage points. In line with previous trends in seniors’ support in presidential elections, Trump leads Clinton among these voters. According to the NBC News Exit Poll, one in 10 voters said they voted for the first time today. The majority of these first time voters said they voted for Hillary Clinton, and about four in 10 voted for Donald Trump. Fewer than one in 10 voted for a third-party candidate. Part of the reason Clinton is not doing better with this group is that nearly six in 10 first-time voters think the nation’s economy is not so good or poor. More than half say they are dissatisfied or angry with the way the federal government is working. A majority of these new voters are under age 30 and many are nonwhite. But Clinton needs more of them than she appears to be getting tonight. Lesbian, gay, bisexual and transgender (LGBT) voters are maintaining their traditionally strong loyalty to the Democratic Party in this year’s presidential election, according to the NBC News Exit Poll. Among those who have already voted today or beforehand, exit polls show Hillary Clinton winning the support of roughly three quarters of LGBT voters. This is consistent with past results: Democratic candidates have swept the gay vote in every presidential election since at least 1992, when exit polls first asked respondents about their sexual orientation. Clinton’s strong support among LGBT people comes in spite of Trump’s direct attempt to court the group this year with targeted appeals in speeches and even campaign merchandise, an unprecedented move for a GOP presidential candidate.